You can find hundreds of best web hosting company like Bluehost or Godaddy, and each company is good at their own aspect and among them, you may find Bluehost and GoDaddy to be the two best options to choose from. But which one to choose and why? Let us have a little Bluehost vs GoDaddy Review talk here. In the case of comparison like Bluehost Vs Godaddy, there can be no better or worse web hosting company to choose from. However, there are still points that should be considered before buying a domain and opting for a web hosting company. From the pricing plan to features, Bluehost and GoDaddy differs on many levels, and not many people are aware of that properly. In this article, we are here to enlighten you with the information about Bluehost and GoDaddy both. Have a look. Also, Read interesting Comparison Namecheap or GoDaddy for choosing the best domain name registrar. But before we start comparing them both, we might need to have a little bit of information about the basics of Bluehost and GoDaddy first. 2 What is Bluehost Web Hosting? 3 What is Godaddy Web Hosting? What is Bluehost Web Hosting? Founded in the year of 2003, Bluehost is one of the famous web hosting companies that are hosting over 2 million domains with its sister companies namely HostMonster, FastDomain etc. It is founded by Matt Heaton, and currently, the company is owned by Endurance International Group. It is said to be enlisted among the 20 largest web hosting companies in the whole world. What is Godaddy Web Hosting? Founded in the year of 1993, GoDaddy is one of the oldest web hosting companies with more than 17 million of customers. It is founded by Bob Parsons, and the current CEO of GoDaddy is Blake Irving. GoDaddy is mostly famous for its advertising. Not, only that, but GoDaddy has also been chosen as one of the most famous web hosting company as well. It is not easy to compare Bluehost and GoDaddy on the basis of their pricing system because of possible two reasons. Firstly, both Bluehost and GoDaddy have different specials, and thus their pricing plans never come in the same plan. And secondly, their service tiers break differently which makes the comparison quite pointless at times. However, depending on their current pricing system, we have tried to put up a picture here. In the pricing structure of both the web hosting companies, they have the same plans for the first two levels, i.e. Bluehost Basic and Plus and GoDaddy Economy and Deluxe. And in case of the third plan, GoDaddy’s pricing plan is quite higher than the Bluehost one. Talking about the first level plan, GoDaddy and Bluehost have the same price along with the same features; so it does not matter. However, in the case of the Bluehost hosting Plus plan, you will get ultimate database offer while that on the Deluxe plan of GoDaddy, you will not get the unlimited database, i.e. WordPress websites. On the third level, Bluehost Prime is a little cheaper than GoDaddy Ultimate; otherwise, they have almost the same features, only GoDaddy adds SSL certificate to the Ultimate plan. So, from the above discussion, it is pretty much clear that you can go for any one of the above web hostings, either way, you will not be saving much money. 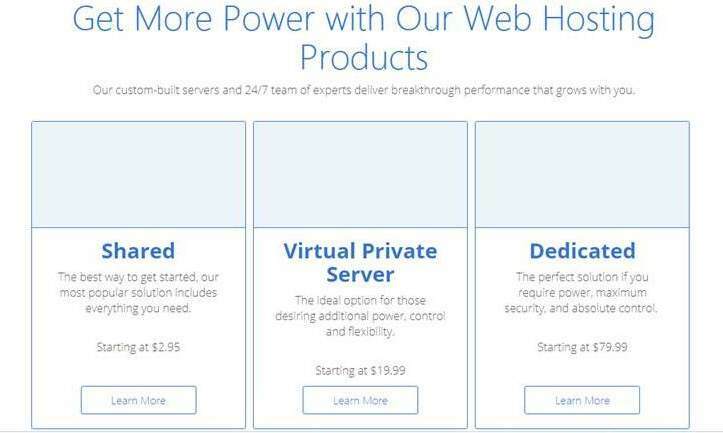 However, after the Bluehost and GoDaddy review, if you want a better service for the perfect plan, Bluehost might be the one because GoDaddy’s price is little higher than Bluehost and also GoDaddy’s ‘Ultimate plan’ features are not promising too. Apart from the pricing system, the hosting features of each web hosting company say a lot about them. As we have seen from the pricing section, both the basic and middle pricing plan of the Bluehost and GoDaddy are almost the same. However, we can differentiate them on the basis of the hosting features. If you want to go for one cheap place to host only one small website for your start-up or any other thing, you can go for any hosting as both Bluehost and GoDaddy have the similar features on level one. They both limit your website but it works equally, so there cannot be any Bluehost vs GoDaddy point. Talking about other features, this is the phase where you actually need the discussion of GoDaddy vs Bluehost. Considering the key hosting features, both the web hosting has an unlimited number of website features. However, the comparison starts at the point of the database. While Bluehost hosting has the amazing feature of the unlimited database, GoDaddy limits the number of the database to 25 only. In case of the top plan, GoDaddy is little pricey than Bluehost and GoDaddy hosting also adds two new hosting features on this plan– SSL certificate and Premium DNS along with unlimited database, websites and disk space. A lot of people may lure into this plan because of the added features, but those features are not really necessary. You can get those features easily from any outside source and that too, at a cheaper rate. Another important hosting feature is the memory limit. Both the web hosting has their memory limit, and the comparison is important if you are planning to set up WordPress hosting. Before the year of 2014, both Bluehost and GoDaddy used to set their memory on a very low limit. However, recently they have updated their schemes. Bluehost has their memory set to 256 megabytes by default. But GoDaddy does not come with such default settings. You can increase GoDaddy’s memory limit, but for that, you have to pay $12 extra per year. So, considering the above points, Bluehost wins as far as hosting features are concerned on the middle and the upper level. Bluehost provides many extra hosting features which GoDaddy does not. However, in case of the basic level, the comparison does not matter because both are equally good. The facility of customer support does not matter if you are a professional in this field. But if you are not and especially if you are a newbie, customer support seems the most important thing ever. In this article of GoDaddy vs Bluehost, I will be discussing both their customer support and experience in details. Bluehost has an efficient customer service option. They are available 24X7, and they have both direct phone option and live chat option, it is up to you with which you are more comfortable. In Bluehost, you can choose the issue beforehand too. GoDaddy’s customer support is also available 24X7. They have a phone and live chat options; you can opt anyone. The live chat option is available from 10 am to 7 pm, Monday to Saturday. Comparing these both, it is concluded that Bluehost’s customer support system is much more transparent, and also they work quickly than GoDaddy. GoDaddy has a fair system of customer service, but they push everything to the phone. Unline Bluehost, they do not have any ‘issue-separating’ option first. Also, the live chat option of GoDaddy is too limited. So, if you are looking for a steady, transparent and efficient customer support, Bluehost is the one. GoDaddy can provide satisfactory result too. It does not matter which web hosting company provides the best service regarding pricing system if the usability of those domains are not good, the whole experience becomes painful. And to have a smooth and convenient user experience, the ‘backends’ and account dashboards should be straightforward. Bluehost and GoDaddy both use cPanel for their server backend, and the both the companies have made their user experience as smooth and convenient as possible. However, let us discuss the Bluehost vs GoDaddy comparison below. 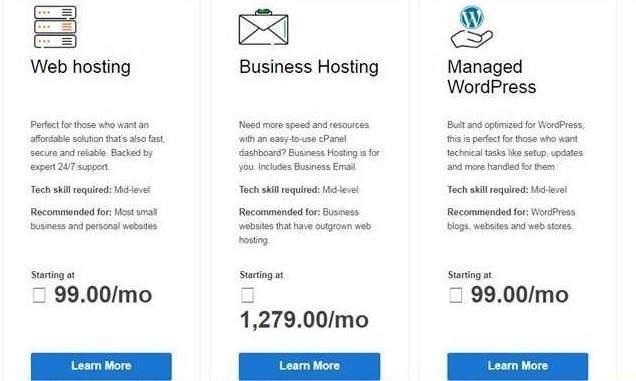 When you sign up for a hosting, you do not get a website; rather you will get a place where you have to put your website. You will be provided by the hosting company with other necessary things such as add domains, install files options etc. Bluehost uses a standard industry cPanel backend server. Although cPanel does not come with a polished feature, Bluehost’s backend server is perfectly polished with many features and quite straightforward too. Not only that, they have arranged it according to a pattern of appearing in different tabs so that the system remains out of any kind of hassle. Also, Bluehost has an educational feature option too. In 2013, GoDaddy had a real good cPanel backend server which was smoother and much more convenient than that of the Bluehost. But it had one lack – in case of building multiple sites account, the system of cPanel becomes clumsy and frustrating. To remove such difficulty, GoDaddy changed it with a new cPanel backend server which is quite more alike Bluehost. And with a little customization, they have given it a simpler interface too. So, in case of usability comparison, Bluehost and GoDaddy have to head to head competition. However, if you are a newbie and want to use a straightforward interface with great compatibility to all features, GoDaddy is the best. And if you want to have a more professional experience, always go for Bluehost. Both the Bluehost and GoDaddy are stuffed with many great features and plans, but the actual quality lies at the time of the performance. And the easiest yardstick to measure performance rate is to use TTFB or Time to Fast Byte, i.e. it is to provide how fast the server gets the request and provide you with the first byte of the information. In case of Bluehost vs GoDaddy, they both have a very close TTFB rate. In the past years, it has been seen that Bluehost had a greater TTFB rate than GoDaddy. But after many inspections, GoDaddy is showing much improvement. Now, GoDaddy’s TTFB rate is almost 33% faster than that of the Bluehost. So, if you are trying to measure them on the basis of performance rate, GoDaddy is currently taking the lead in the race. However, TTFB rate is not static, and it always changes. Thus this verdict of GoDaddy cannot be regarded as the ultimate truth. Just like any other field, the performance ground is also a head to head competition between GoDaddy and Bluehost. In the above comparison of Bluehost Vs Godaddy Hosting, there were many points where Bluehost won, and there were many points where GoDaddy took the lead. However, comparing the whole Bluehost vs GoDaddy, it is safe to assume that Bluehost is comparatively better than the GoDaddy. GoDaddy provides adequate and satisfactory results too, but if you are looking for an overall rating, Bluehost will win the race. Nonetheless, in a web hosting situation, there cannot be any best or worst, and thus it is up to the user to choose the best from the lots. Depending on your purpose and need, choose the best one from the battle of Bluehost vs GoDaddy. Great post. Amazing webhosting comparison between Bluehost vs Godaddy. Thanks for sharing this best web hosting comparison. This site is adorable to all. We can get a lot of information like this about best webhosting Godaddy vs Bluehost web hosting.